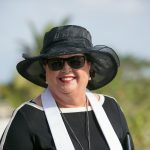 This bride from Elkins, Arkansas is a woman after my own heart, she's a planner, and doing all the research and planning beforehand meant that she could relax and enjoy her wedding day in the beautiful Cayman Islands. 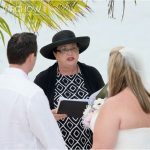 As I tell my couples, your special day will be worry-free when you book with the Cayman Islands cruise wedding specialists, Simply Weddings. I arrange to pick you up in the Simply Weddings SUV and take you to our office where you can relax, and get ready while your Special Marriage License is obtained. We can't get the SML until you are physically on the island (unless it's a weekend or Public Holiday, when we have to make special arrangements). This bridal couple had pre-selected My Secret Cove as the special place for their wedding. Here they are saying their vows on the little natural staging area. Although it was only 9:30am I was glad to get some shade in this little spot. Don't you think these "Just Married" T-shirts they changed into afterwards are very cool? This is a good shot of Smith's Cove, which has been recently improved by our Parks and Recreation Department. It is really kept in excellent condition by their cleaning crews, and I never miss the opportunity to let them know how much I appreciate this. The newly-weds pose with the new signage at the Park. This is the real name of this park, it's the name I knew this spot as when I was a girl growing up in Cayman. 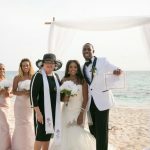 It is very easy to get married in the Cayman Islands as there is no required residency period, you can be married the same day shortly after you disembark from your cruise ship. 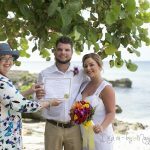 In one hour you can be married, and back in George Town where you can have lunch, explore the shops, or even take advantage of some of the island tours. If you are traveling alone, we would be happy to arrange witnesses for your ceremony as required by law. If you are traveling in a group, we can arrange for a brand-new air conditioned bus to pick you up and take you to the wedding location. Whatever you envisage your Cayman wedding day to be like, we work with you and within your budget to make your dream of a Cayman Island wedding come true. Call Joy or Peggy +1 (345) 9499933 and see our Cayman Islands wedding packages.